Fish heads, fish heads, eat them up—YUM! Remember that child-hood song? No? Am I dating myself? 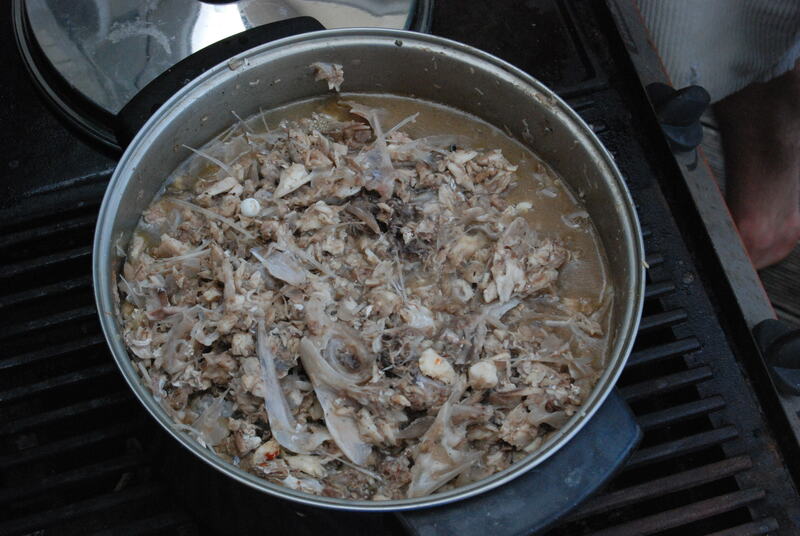 Fish-heads are a wonderfully useful component in cooking one of the most essential elements of cooking seafood. Ask any professional chef about the ingredients of their lobster bisque, clam or fish chowder, or bouillabaisse and Anthony Bourdain, Jacques Pepin, Alice Waters or Julia Child (be it from heaven, in her case) will tell you about fish stock. And how does one make fish stock? Watch and learn from a few sea-seasoned fellows of good Kiwi (that’s a native of New Zealand for all you Northern Hemisphere folk) fishermen stock. First, catch the fish and keep them on ice. Once you’ve caught the fish, though, and before you put it on ice, make sure you get a good picture of you and your fish, so that you don’t end up with one of those stories where the fish changes size from telling to telling depending on how much Lion Red (Coors or Budweiser for you Yanks) you’ve imbibed. 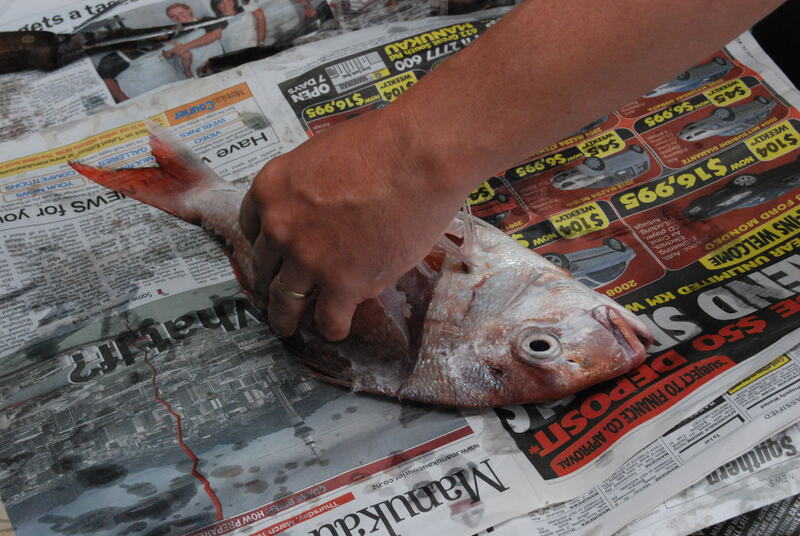 Put down lots of layers of the New Zealand Herald (any newspaper will do) and lay out your fish. Any good-sized fish will do, as long as it’s got a head. 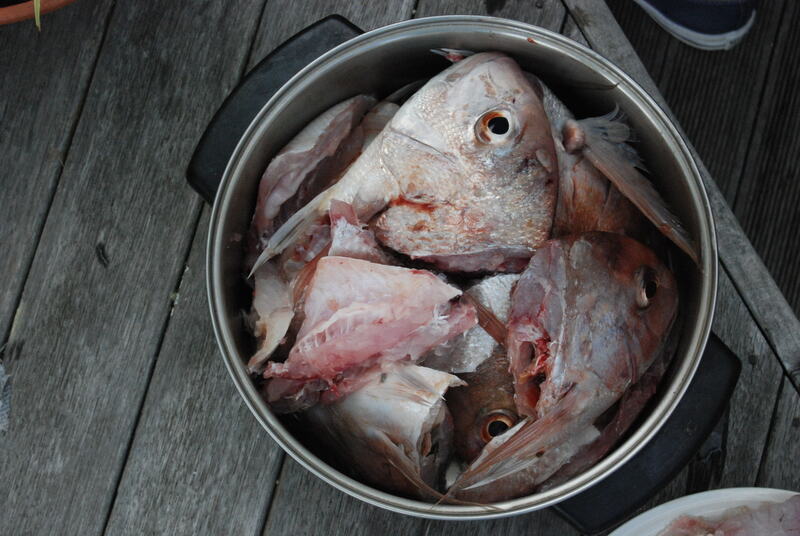 Pictured here are quite a few snapper and a trevally, a south pacific species. You’ll need quite a few, so make sure your mates go you with you when you’re out on your boat; it increases the competitive juices and makes for more successful fishing. Of course, you’ll also want to properly gut and fillet your fish so that you have lots and lots of delicious fish for grilling, adding to chowder (see recipe below) and frying up with some hot chippies (not just for take-aways anymore). 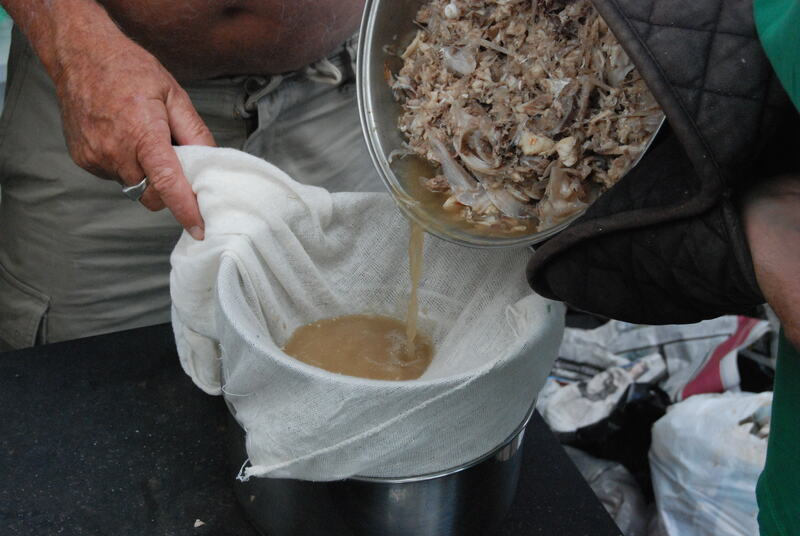 Add all your fish heads and discarded bits into a stock pot and fill with water. Also add a handful of other stuff, always including the onion and lemon/lemon juice. Other recipes recommend white wine and parsley stems, celery, carrots, thyme and bay leaves, and omit the oyster and soy sauces. My advice is to consider what the final recipe will include (if you’re going Asian, go with the soy sauce, but not so much for the traditional bouillabaisse) and go with what you’ve got on hand. I’m a firm believer in throwing together what you have on hand and not busting a blood vessel or your budget to make something amazing, when something really good will suffice. Simmer your selected ingredients for a few hours; your finished product should look like this. Don’t worry. It may not look appetizing in this form, but it can be made into something wonderful, especially when you strain it very carefully through a double layer of cheesecloth. As pictured, you may want to do this either outside or over the sink. It’s a bit messy, but anything delicious is worth getting dirty for. Now that you’ve taken a great trip out fishing, caught your fish and cooked up all those rolly, polly fish heads to make a phenomenal stock, you can make dinner. Fortunately, after all that work, this recipe is really easy. Mix your thickener and 1/4 cup of stock together until it’s an evenly textured paste, then add it to all the other ingredients, minus the fish and simmer on low heat for about 20 minutes. When your soup is hot and your veggies are crunchy but tender, add the fish and cook another 10 minutes. Cook it up and tell me what you think. By all means, buy some fish stock to save some time, just tell me if you like the chowder. ‘Til next week! Chow and ciao! A very entertaining and informative article, we have a few snapper in the freezer, I wonder if you can use the heads even if they have been frozen? As long as you thaw the fish, cut off the heads and use it all within a few hours of thawing it, you should be fine. Just don’t re-freeze any of it, even once you’ve made the stock- use it right away. Thanks for your question, and give lots of hugs to all for us. Thanks for the excellent post! I really enjoy your no nonsense cooking instructions. Any other suggestions for using up that fish stock? The heavy cream is a no go here, but the stock itself sounds delicious!